Tossing the very fine name Little League due to legal issues, the five guys who comprise the newly monikered Kill Verona haven't allowed its struggles affect the music in a negative way. In fact, the experiences endured have made Trauma, these Philly native's captivating five-track EP, that much more intriguing. Dabbling in the paints of such bands as Thursday, Rival Schools, and Taking Back Sunday, Kill Verona's passion is visceral, aptly shown on such draining emotive tracks like the driving "Hard Times, Black Lines". Add in the kind of dramatic dynamics of bands like Hum, My Bloody Valentine, and Far, and you come up with "Danger Boy", a breathtaking five-minute view featuring shimmering melodies colliding against an aggressive undercurrent. Want real deal emotion without the whine? 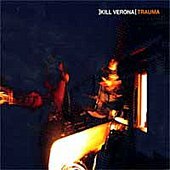 Kill Verona is your band.